On the hunt for the best kitchen bin? Probably not the first thing you think of when it comes to designing your dream kitchen, but hear us out: it’s quite possible that your kitchen bin does among the hardest work of any kitchen item, and for that, we think we owe it to you to find you a good one. But what does ‘a good one’ look like? What is the best kitchen bin out there? Generally speaking, it’ll be built to last a while, won’t let smells leak out into your living space, and will be big enough for your needs. For more kitchen advice and product recommendations, head to our kitchen hub page. What is the best kitchen bin? In terms of the best all-rounder kitchen bin, our top pick is the Morphy Richards Chroma Sensor Bin with Infrared Technology because it ticks all the boxes. It's affordable, sleek, available in lots of different colours and it opens when you wave. It's also square shaped so it fits nicely into a corner and it's available in two different capacities for different size kitchens. Depending on the size of your household and how much rubbish you generate, you’ll have to think about the capacity that would be useful to you. Anything between 15 and 30 litres should be be just fine if you live alone or with one other person and don’t throw away an above-average amount of stuff; a 30 to 40 litre bin is generally advisable for families of three whose bin gets taken out quite frequently, while 40 to 50 litres is the best bet for four or more, or those who don’t want to take out the rubbish any more than they have to. After that, it’s all a matter of style. If you think all bins are a bit of an eyesore, then think again, because a big kitchen bin needn’t necessarily disrupt your interior scheme. From sleek modern designs to the odd bit of vintage charm, we have it all, so read on for a good dose of what we like to call 'binspiration'. For those who can't be dealing with pedal bins and frequently have messy hands while in the kitchen, opt for this sensor touch bin by Morphy Richards. Featuring a contemporary design and available in a choice of black, cream or stainless steel to fit in with your kitchen decor, the bin has a steel body with non-corrosive colour coating and a retainer ring for easy replacement of bin liners. It's available in two different sizes to suit small households or large families alike, and its sensor activated lid closes on its own after five seconds of inactivity. Another thing to note is that it's square, so it fits in a kitchen corner quite nicely. Tried and tested by the Real Homes team, it's the best kitchen bin you can spend your money on, we think. The only way to complete your smart kitchen, the Simplehuman rectangular sensor bin works by saying 'open can' or by a wave of your hand. Featuring a modern, sleek look and a nano-silver clear coating to protect from fingerprints and germs, the bin has two compartments; one for recycling and the other for everyday waste. To work, the bin can either be plugged in or it needs six AA alkaline batteries. The best kitchen bin for those after something smart, we think. 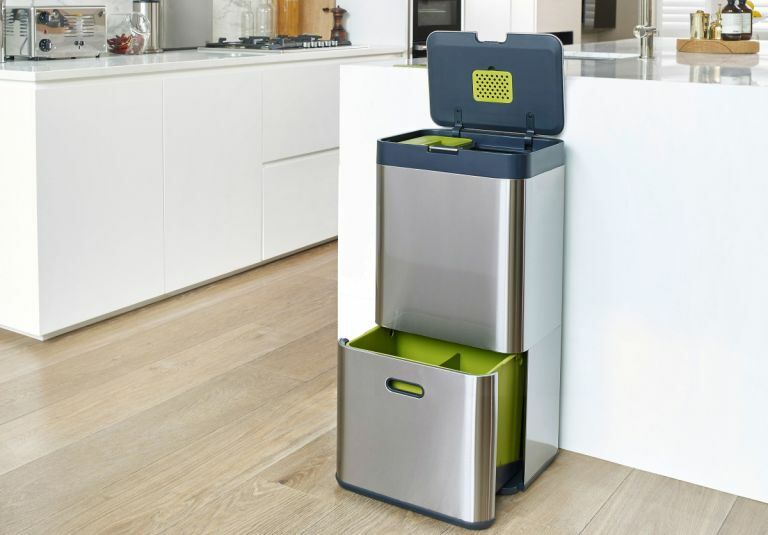 As space-saving solutions for the kitchen go, this bin is a real winner, and its ability to hold up to 90 litres in the footprint of a 30 litre bin earns it our top spot. Its trick is quite amazing: just pull out and up on the integrated handle, and push down on the seemingly full bin to compact the rubbish for three times more space. It also aims not to stretch or tear your bin liners, and the replaceable odour filter stops unpleasant smells reaching the rest of the kitchen. Our pick of the best kitchen bin for convenience, compactness, and cleverness. If you’re the proud owner of a retro style kitchen and don’t want a huge unsightly receptacle overshadowing it, the Swan Retro 45ltr bin should be your go-to. It comes in a range of vintage-look pastel shades with chrome trim, and looks very sleek indeed, thanks in no small part to the lack of bulky pedals or handles. Instead, the bin’s clever sensor opens when the user is 5-15cm away, so you don’t have to risk the spread of germs, and the helpful bin bag retainer ring means no awkward bits of bag to give the game away, either. The best kitchen bin for retro kitchens! Like to recycle but no room in the kitchen for a second (and third) bin, or just trying to avoid a cluttered look? Go for this two-in-one pedal bin, which keeps waste separated into two hygienic compartments – the colour-coding makes it easy to remember which is which, and the sleek and simple brushed metal container looks very neat. Each compartment is on the smaller side at 15 litres each, so while it unfortunately may not be the best solution for big families who would rather keep trips to the outdoor bin to a minimum, for smaller households that don’t generate much waste, it’s a great buy. This brushed stainless steel bin is sure to look very elegant in all manner of kitchens, but its simple design hides bags of features intended to make life more efficient, an always-intriguing prospect for busy families. Its fingerprint-proof finish needs no upkeep, its silent-close lid and non-skid base keep things steady, and its removable inner bucket for drip-free disposal is frankly genius. It also packs a decent capacity in a relatively small footprint, and can be tucked flush against the wall thanks to the internal hinge. No fuss, no mess – in our opinion it's the best kitchen bin for families. Shop more Simplehuman products at Amazon. Classic homewares brand Brabantia can always be trusted to come up trumps with a top-quality item, and this 30 litre kitchen bin is no exception. Made from durable materials in a fabulous range of colours – Pansy Purple is a particular favourite of ours, as well as Daisy Yellow – and with a 10 year Brabantia guarantee, it’s certainly engineered to last. Its removable stainless steel lid for easy bag replacement and silent, soft-touch lid are added bonuses. A solid investment, and the best kitchen bin for those who are after something a little different colour-wise. Find more Brabantia bins at their Amazon page.